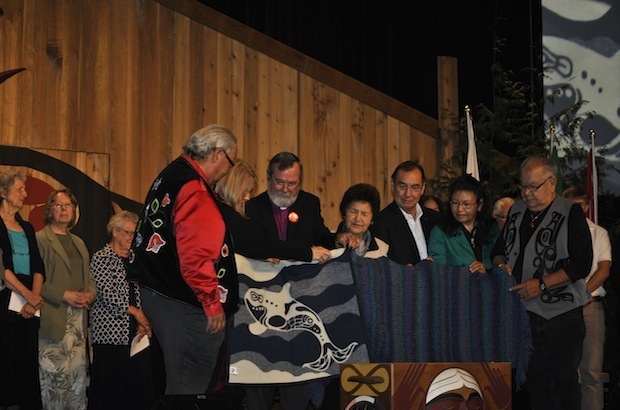 Vancouver— A woollen baby blanket with the symbol of the sea wolf whale that sings a song and a prayer shawl were offered on Sept. 21 by the Anglican Church of Canada as “expressions of reconciliation” at the , which is aimed at documenting the experiences of Indian residential school survivors. Over a thousand survivors, their family members, representatives of churches and government, and local citizens gathered at the Pacific National Exhibition (PNE) for the event held Sept. 18 to 21. The Anglican church’s expressions of reconciliation were presented by Archbishop John Privett, bishop of the diocese of Kootenay and metropolitan (senior bishop) of the ecclesiastical province of British Columbia, and Charon Spinks, an elder from the Interior Coast Salish in Lytton, B.C. A parishioner at St. Mary’s and St. Paul’s Anglican Church, Spinks attended the Anglican-run St. George’s Indian Residential School in Lytton, where many abuses have been recorded. Privett, who—along with B.C. bishops, local clergy, lay people and staff of the national church—listened to survivors’ accounts at the churches’ listening area, the TRC commissioners’ panel and other gatherings, said he had heard stories of immense loneliness, fear and confusion. “The most painful of all I’ve heard are the stories of widespread abuse,” said Privett, adding that he has been “personally shocked and saddened and shamed” by the legacy of residential schools and the part that the Anglican church has played in it. From the late 19th century until the mid-1990s, about 150,000 First Nations, Métis and Inuit children were taken from their homes and sent to residential schools as part of the government’s policy of assimilation. The Anglican church operated over 30 of these schools across Canada; and the rest were run by the Roman Catholic, United and Presbyterian churches. While the past cannot be undone, “what we do now can shape a better future,” said Privett. The Anglican church is committed to taking concrete steps to show its sincerity in working toward reconciliation, he said, noting that the primate, Archbishop Fred Hiltz, has established a commission that will look into how the church can do more to help advance reconciliation. “We are committed to the process of restoring right relationships and laying the foundation for the future,” said Privett. He noted that the church has repudiated the Doctrine of Discovery and has endorsed the UN Declaration on the Rights of Indigenous People. It is also working toward the full realization of a self-governing indigenous church, he said, adding that at the General Synod last summer, the church celebrated the establishment of a new indigenous diocese of Northern Ontario. Her grandfather also strongly believed that “we are here to help another human being.” Spinks said that as a result, her mother became a pastoral elder at the Anglican church, and Spinks herself, a community worker, has focused on helping her fellow survivors heal. She urged survivors not to live in fear and doubt, and urged them to tear down the walls of grief and trauma so that a better, more beautiful life can emerge.